Vanguard Cadets celebrated the corps' first championship win in five years after coming out on top of the 2013 DCI Open Class World Championship Finals on Tuesday, Aug. 6 at Ames Field in Michigan City, Ind. "I'll never forget how much I shook during the awards ceremony," Drum Major Carl Huang said. "I keep thinking I'm still sleeping in the gym, about to be woken up from this amazing dream." Scoring 96.15, Vanguard Cadets took top honors in brass, color guard and general effect with its 2013 production, "The Art of War," which follows a group of soldiers who set up camp after a big fight, then have to go to war again. According to Huang, it addresses war's effect on an emotional level. "This whole group of Open Class corps is just fantastic," Santa Clara Vanguard CEO Jeff Fiedler said. "This is a show [Open Class Finals] people should see that most people miss. We should have thousands of people watching this because it's just a fantastic competition and unbelievably entertaining." 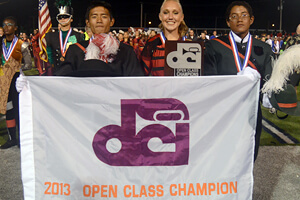 Vanguard Cadets react after winning the 2013 Open Class World Championship title. 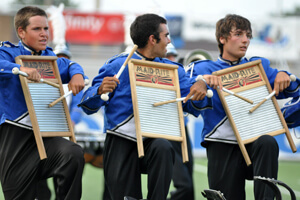 Taking second place by less than half a point, Blue Devils B (2nd, 95.70), won the percussion caption award for the fifth year running, with its 2013 program "Warped." "Championships has been a realization for us that win or lose, we are Blue Devils," Drum Major Niko Martinez said. "We brought it today." Martinez said the crowd roared with applause when he stopped conducting in the last part of the show, turned to the crowd and fell to the ground, a new addition in the theme of the production that was put in just for the Open Class Championships. "They surprised me this year with the show concept and the amount of talent we had," Blue Devils B Director Rick Odello said after scores were announced. "That's part of the fun – to see our growth from the winter all the way to the climax of the Championships." Genesis (3rd, 91.55), founded just four years earlier in 2009, earned its highest score and highest Championships placement as a corps thus far, after a sixth-place finish at last year's Open Class Finals. Voted on by the corps directors, Genesis was named the Most Improved Open Class Corps of 2013 on Tuesday night. "Tonight's been by far the best part of the season," Director Chris Magonigal said. "Watching the kids' faces when the scores were announced, I could hear the air come out of them; it showed the relief that their hard work paid off." Earning second place in the color guard caption, Spartans (90.50) finished in fourth place, with Music City (5th, 90.35) and Gold (6th, 86.75) following behind in overall score. "The biggest challenge for the corps has been endurance, because the corps members are young, and it took a good amount of time for them to build up strength," Spartans Drum Major Cody Morgan said "But tonight it finally all came together." Similarly, 7th Regiment (7th, 86.60) doubled in size between 2012 and 2013, not only creating a membership of 80 percent rookies, but also adding an extra challenge for the corps' staff and members who were not used to working with such a large group, according to Drum Major Christina Nadeau. "Luminous," 7th Regiment's production, includes drill formations representing constellations and the moon. "There's a moment in our show with some body movement that's so amazing – I can't help but stop focusing on the conducting and just look right at it," Nadeau said. "Seeing that makes me realize how far our percussion section, brass and guard have come." Legends (8th, 85.70) finished behind 7th Regiment by less than a point and just ahead of Raiders (9th, 84.95). Raiders' production, "The Raven: Descent into Madness" delves into one of Edgar Allen Poe's works. The corps' production begins with the narrator of the poem hearing a tapping noise, escalating until the final movement, in which the Raven drives him to madness. "This last week and a half has almost been constant performances," Raiders Drum Major Jack Kaplan said. "We've had to push ourselves to be mentally and physically prepared for the tour's demands. It all shows the drive and dedication our members have to get to Finals and put on the best show that they can." Colt Cadets (80.90) finished 10th, with their production "Red," which takes the audience through four emotions: love, angst, passion and pride. "There's something irreplaceable about Finals night energy," Colt Cadets Drum Major Betsy Guthrie said. "I'm so proud of what we've accomplished this season." Les Stentors' (11th, 76.65) 2013 production celebrates the corps' 25th anniversary and connects different pieces of the corps' history throughout each movement. Jumping from one style to the next as many as five times during one section of the show creates an added challenge for the corps, according to Tour Director Sebastien Roux. "For the past few years, it's been pretty hard for us to find kids, but we're doing it," Roux said about recruiting members in Quebec. 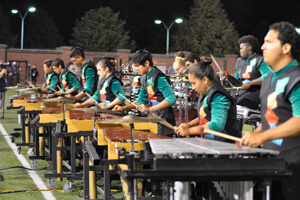 "The color guard and drum line are considerably stronger than last year, and I'm so impressed by the work that the kids and the staff have put in." 2013 also marks an important year in the Racine Scouts' (12th, 70.40) 61-year history, as the corps made the Open Class Finals for the first time ever. Its show, titled "From the Ashes," is about the organization's rebirth, after coming back from a prematurely-ended 2012 tour. "After last year, it was really rewarding to be on the Finals stage," Drum Major Nick Hoffman said. "We're all so proud of ourselves and each other, words can't describe it." Taipei Yuehfu (77.35) received the distinction of 2013 International Class World Champion, the only member of that class to attend the World Championships this season. 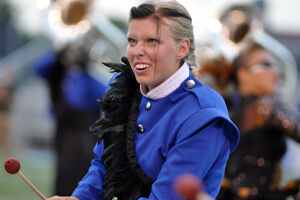 Open Class corps Blue Saints performed in exhibition, after placing 13th the day before at the Open Class Semifinals. All of the corps performing at the Open Class World Championships will go on to compete in DCI World Championship Prelims, held in Lucas Oil Stadium in Indianapolis Thursday, Aug. 8. View a complete recap of scores from Tuesday's Open Class Finals. View a photo gallery from this event on Facebook. Read about the results of Monday's Open Class Semifinals. View the complete schedule of 2013 DCI World Championship events. Contributing to this report: Casey Follen, Johny Gilbert, Jessica Skogh, Chris Weber.